Sometimes overlooked, sound deadening plays an important role for any car audio installation. We have an excellent display for you to come and see working in our showroom to demonstrate the advantages of sound deadening. Whether you use a little or a lot, sound deadening makes a MASSIVE difference to any audio system, even the factory one. We recommend using the products by Skinz. This product is a three step solution to improve and protect any vehicle speakers and when used in conjunction with other selected brands you will receive a 3 year extended warranty on the speakers you choose. The first step is to use a product which eradicates rattles and vibrations for a superior musical performance. Inherent problems due to road noise and car panel vibration which can be caused by the mechanical movement and the displacement of air by speakers has a negative effect on the SPL and sound quality of your car audio system. This can be overcome by using Skinz damping product on the metal panels behind the speaker and around the speaker. Step 2 is a product which sits directly behind the speaker to reduce back waves, ensuring a tighter punchy mid/bass speaker performance. 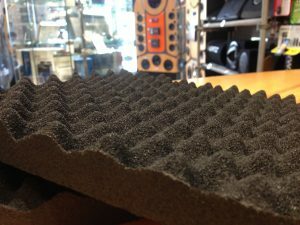 Skinz Wave Diffuser is an ultra dense foam damping material used extensively to control acoustics in the recording studio industry. Now specially treated to reject moisture it’s benefits can now be achieved in car door applications. Its sinusoidal profile helps eliminate rear sound waves from reflecting back through the speaker cone causing sound cancellation. By attenuating unwanted sound waves from behind the speaker, greater sound energy is gained. Thanks to its excellent elasticity, flexibility and damping properties, Skinz Wave Diffuser will help deliver a far more open dynamic midrange with a much tighter mid/bass performance from any speaker. Step 3 is a product which is applied to the top of the Reference system. 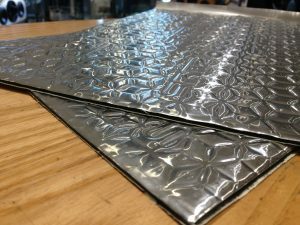 Skinz Panel Liner offers a vast improvement in noise suppression when fitted on top of Skinz sound deadening and installed between the door card panel and door. 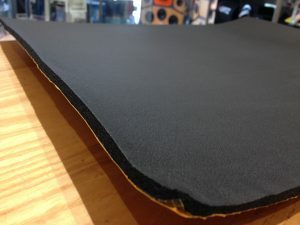 Formulated to fit complex forms, this thick flexible acoustic insulating foam improves the listening environment in a car by radically reducing the effects of panel amplified road noise. Available in 6mm and 10mm thickness. Subwoofer distortion and low SPL result when your subwoofer causes vibration and movement of your vehicles body panels because the vehicle was not made to contain excessive sound pressure levels (SPL). Skinz is one of the most effective and easiest ways to control sound. When the vehicle is stabilized with Skinz, the maximum potential of your subwoofer is realized. You get the tightest, loudest bass that your subwoofer can produce. The faster you drive, the louder the road noise, as the road noise increases your music goes away. A new amplifier can make the music louder, but it can’t restore the music hidden by the high noise level. Much of this noise enters your vehicle through the doors, as this is the thinnest material in the vehicle. Using Skinz in the doors, restores as much dynamic range as a new amplifier adds, even with an amplifier that is double the wattage of your old system. Skinz and a new amplifier will maximize your total system and you will Hear More Music. If you have any queries about soundproofing, please click the button below to contact us. We traveled from Rotherham to get these guys to fit some reversing sensors to my wife’s car, I’d been before and they were very professional for both alarms and a radio on my van and this time as before they were brilliant. The work was completed ahead of time and one of the guys came out and spent 10 minutes explaining EXACTLY how parking sensors worked which was great as I hadn’t a clue. We are very pleased with both the professionalism of the people and the work in which they do. Perfect!!! Many, many thanks for such a great company. When I arrived back home after my short trip from Source to Donny today, I thought a short thank you email was in order. When I first sat behind the wheel and heard what a difference your adjustments had made, I was very pleased. I put Pink Floyds’ “Dark Side Of The Moon” in and set off for home. When I pulled onto my drive, I couldn’t get out of the car for 10 minutes because the CD hadn’t finished. It was stunning ! All the meticulous work you put into my install came together today and exceeded all my expectations. The sound stage is now immense, fills the front of the car and is fully balanced to my seating position. A great many thanks to you and all the team at Source Sounds, I wish you every success in the future.